Lust for Live Acoustic - a series of intimate live music performances by local original artists. 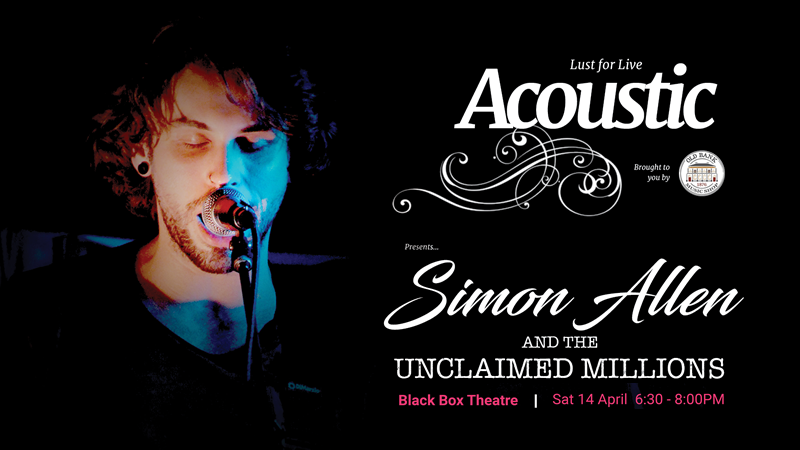 Lust for Live Acoustic is presented in the Black Box Theatre. Located upstairs in the Community Arts Centre at the Western Plains Cultural Centre, this raked theatrette is the perfect setting for an intimate music performance. Doors open at 6:30pm, with bar available. Tickets $10 presale (+ booking fee) or $15 at the door. All presales will receive a bonus free and exclusive Simon Allen and the Unclaimed Millions song download.